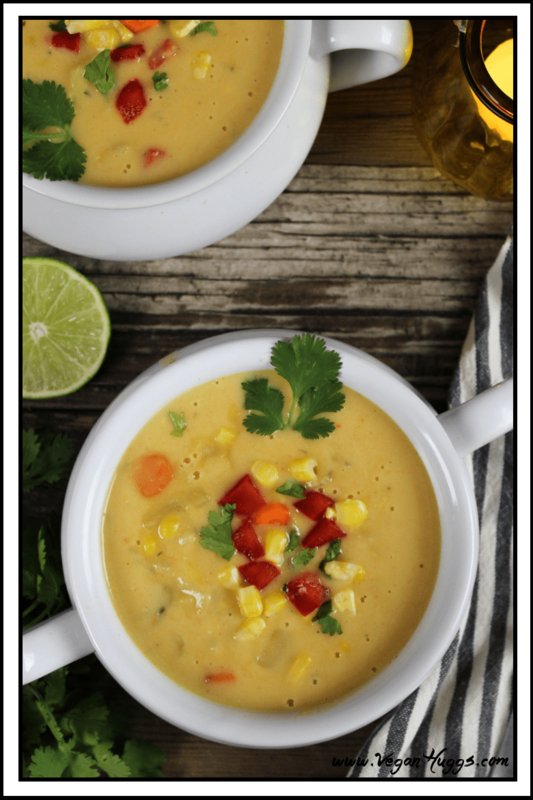 This Creamy Vegan Potato Leek Corn Chowder is hearty, healthy, sweet and satisfying. Perfect for any season. It’s gluten-free, dairy-free and delicious! Yep, it’s summer time and fresh corn is everywhere. 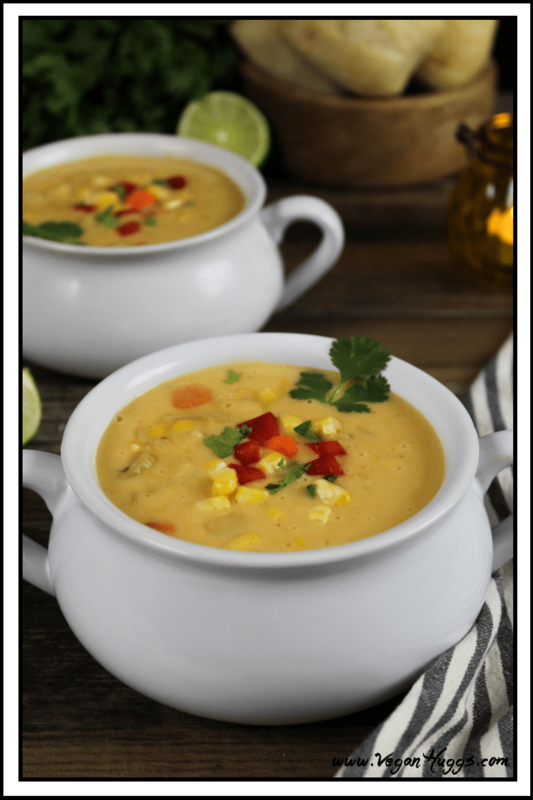 It’s the perfect time to share my Vegan Potato Leek Corn Chowder recipe. I love heading down to the farmer’s market and picking up those lovely stalks. It’s absolutely perfect for the grill and makes every barbecue complete. Corn on the cob is very nostalgic for me…I remember having family barbecues and I was in charge of peeling and cleaning them. My uncle would buy a huge bag and it was all for me. This job was serious business for me and I had each cob, grill-ready in no time. There are so many other ways to prepare these sweet & crisp golden kernels, too. They are delicious hot or cold, cooked or raw and they are perfect for casseroles, soup, salads, sides, dips and more. The options are endless and they add a nice sweet bite to every recipe. If you are a corn lover like me, you might want to serve this soup with my Zucchini Corn Fritters or these Gluten-Free Corn Bread Muffins. These will take your meal to another level of goodness. Go for it! 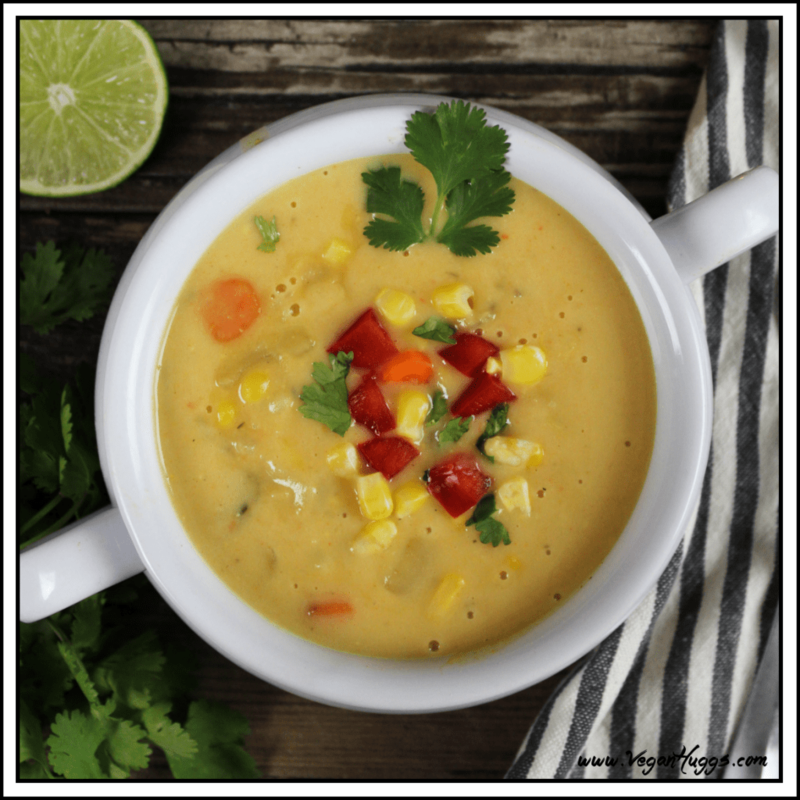 This Vegan Potato Leek Corn Chowder is the perfect summery dish. It’s creamy, hearty, healthy, sweet and savory. I definitely enjoy this soup in the fall & winter, too. It’s so comforting and satisfying. I just make sure to freeze some corn before the season is over. Store-bought frozen corn works, too. Fresh always tastes better, but sometimes it’s not always possible to get. 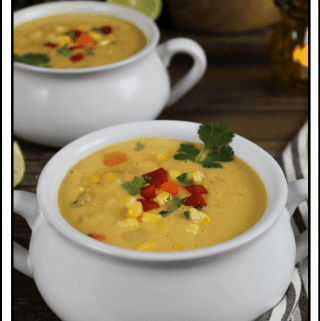 A classic corn chowder soup, contains heavy cream, butter and even bacon sometimes. These ingredients are unnecessary and seriously unhealthy. This vegan chowder, is still creamy, buttery and delicious, but now it’s healthy for you. Sounds like a win-win situation to me. Instead of heavy cream, I use full-fat coconut milk. I promise, it doesn’t taste like coconut, but any plant-based milk can be used. The potatoes make this soup creamy on its own, so you could forgo the milk all together. Just add 1/2 cup more veggie broth or water. I added some sautéed leeks to this pot off golden goodness to boost the flavor. However, they aren’t needed and the sautéed onions will taste wonderful on their own. I used a gluten-free flour to give the soup more body, but you can use any all-purpose flour or just omit it all together. Just add another small potato into the mix. It all works, this soup is very versatile and you can add some spice, too. If you make this recipe, I’d love to get your feedback. You can leave a comment below, and let me know what you think. It would really make my day. You can also follow me on Instagram and share your creation with me. Just tag me @veganhuggs and hashtag #veganhuggs so I don’t miss it. Add corn and bring back to a light boil, then reduce heat and lightly simmer for another 5-8 minutes, until vegetables are tender. Remove from heat & remove bay leaf. Add the coconut milk and lime juice, stir well. Check for salt and add more, if needed. Using an immersion blender or regular blender, blend about half of the soup or more, depending on your desired consistency. Serve in your favorite sound bowls with some fresh bread and a lime wedge. Enjoy! 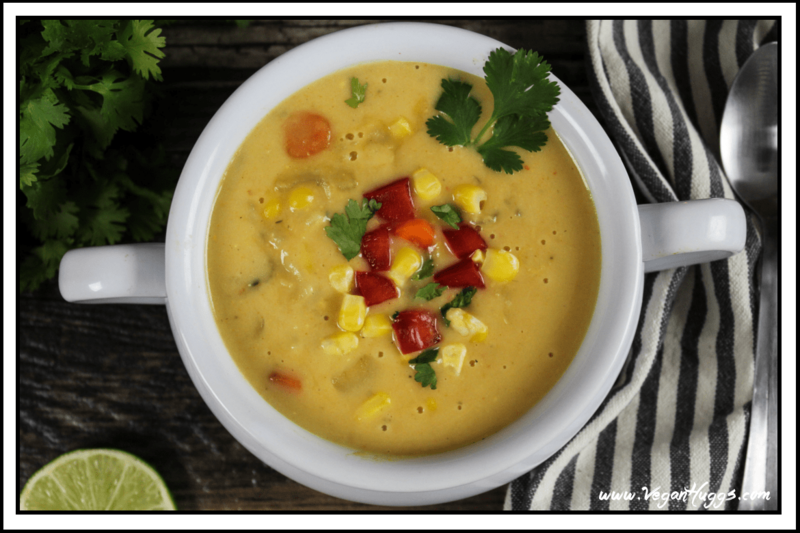 Topping Ideas: Fresh-cut cilantro, diced red bell pepper, green onion & red pepper flakes If you don't have or like full-fat coconut milk, you can use any unsweetened plant-based milk. It will still be creamy and delicious. *Leeks can be very dirty inside the layers, because they are grown in sandy soil. To clean thoroughly: Cut off the dark green part and discard (or save for stock). Cut off the roots, and slice the stalk lengthwise in half. Now slice the entire leek into pieces. Place in a small bowl of water and swish around to release the dirt. Place in colander and drain well. We had this tonight and was just delicious. Creamy without cashew cream. Will be on our regular list as it was super filling as well. Delicious recipe! Wow! 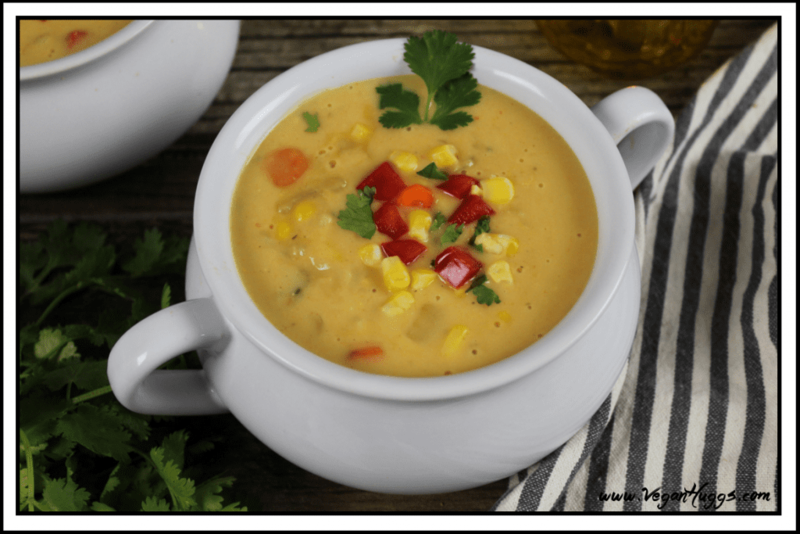 I’ve been looking for a dairy free corn chowder and here you were! Changed a couple things but it is such a rich tasting soup. Well done. I’ll definitely add this to my recipe book. This is delicious! I’m not sure we can wait for dinner to eat it! Made this recipe it is awesome! I can’t stop eating it I added serrano peppers to give it some spice and topped it off with cilantro! Delicious! Followed the recipe exactly as written and it was wonderful. Thank you! Thanks for getting back to me!! I braved it and used the Blanched Almond flour, it worked out great!! It tastes AMAZING!!! Thanks!! Just made this and it’s delicious. My wife just said, “I don’t want to stop” – and got up to dish her third bowl. Thank you! Would love to know calorie count. We are not vegan, but my husband is sensitive to dairy. I’ve been looking for a creamy soup to try and this was a big hit! We left out the red pepper, but followed the recipe otherwise. It was delicious! Amazing!!! Made this tonight and it is a fabulous recipe. Mostly stuff from the farmstead. Thanks for the recipe! I have this cooking now. How ver, I notice a comment about paprika, and don’t see it in the ingredient list. Am making this today. 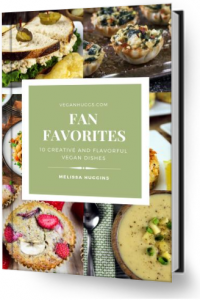 I love that it’s dairy free as my mom who has kidney disease can also eat it : ) Thanks for the great recipes! I am newly vegan and learning alot!